A local business to us asked us to help with the supply and installation of a prime power 50kVA diesel generator. This was to be used 8 hours a day for their welding and fabrication workshop in Southampton so had to be reliable and economical. After some discussion and the customer voicing his concern over previous supplier’s choices of low quality alternators; we recommended the Perkins powered AP45S (45kVA prime / 50kVA maximum) complete with a high quality Newage Stamford alternator – that should handle the starting loads of the workshop equipment. It also came to light that there was a residential property close to the workshop so we suggested an upgrade to the soundproofing material of the acoustic canopy and the exhaust silencer. This was an inexpensive way of ensuring the unit would not disturb the neighbours and would make the customer very happy. Lastly we also fitted an external 5 pin 63A red 3 phase socket complete with protection MCCB – the customer could then quickly connect the unit and it would be ready for work. It was all agreed, the unit was built to the customer’s specification and delivered to Southampton within 10 days of the go ahead – how many of the online resellers could do that! As well as having standard diesel generators for sale UK we can modify the units to suit a particular installation. We also install, service and repair diesel generators – it is worth asking a potential supplier if they provide that kind of back-up for a large and critical item such as the installation of a standby power system. It is not just projects in Southampton that we can assist with. 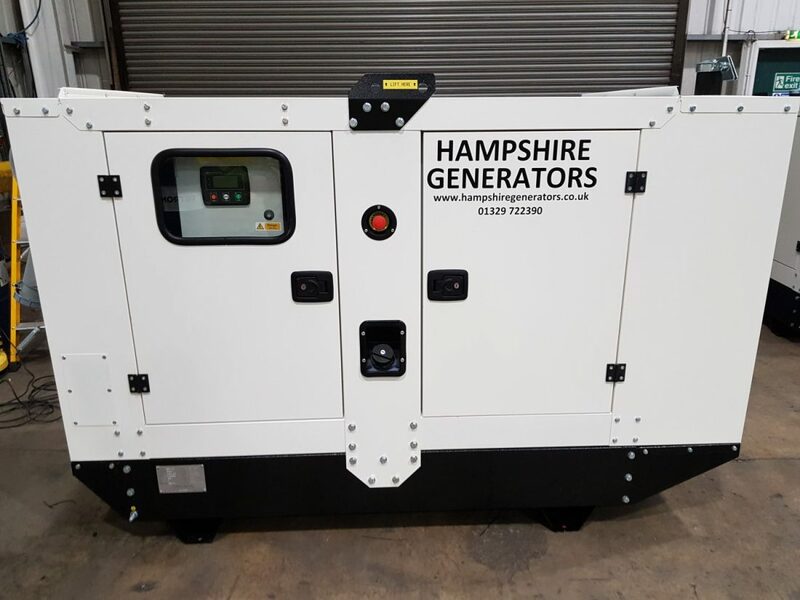 Hampshire Generators sell petrol and diesel generators nationwide with full backup of our own service engineers and workshops. We also have an extensive network of suppliers and engineers that can provide around-the-clock support. Contact us for any diesel generator requirements you have – purchasing diesel generators, installing a diesel generator or servicing a diesel generator – we have it covered.